Fontainebleau is famous for its forest and grand Palace, which was once home to the Kings and Queens of France. Originally a royal hunting lodge, the Palace itself was extended by successive monarchs and has witnessed many historic events like the 1685 Edict of Fontainbleu and the 1762 Treaty of Fontainbleau. In 1814 Napoleon bid farewell to his ‘old guard’ in the White Horse Courtyard - now the ‘Courtyard of Goodbyes’. The surrounding forest is as popular as the historic palace, and as a National Park it's a favourite with hikers, horse riders and climbers. Fontainebleau is currently home to the elite, world-renowned INSEAD business school and several important French institutes. Chateau de Fontainebleau is a glorious place to visit - filled with opulently extravagant interiors and surrounded by beautiful gardens. A one-time favourite of Napoleon's, who oversaw its vast remodelling, it's a property that's truly fit for an Emperor! Spend an afternoon hiking through the lovely 49,000-acre Fontainebleau Forest. There are also mountain biking trails and places to go rock climbing if that's your sort of thing. Chateau de By Thomery, whilst not as impressive as Chateau de Fontainebleau, is nonetheless an impressive place to wander around. 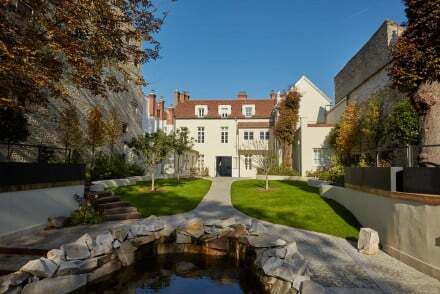 The best places to stay in Fontainebleau provide an ideal base for exploring this beautiful area of France and the heritage. Hotel de Londres is a charming property with stunning views of the Chateau. Their rooms are tastefully and classically decorated, with artwork on the walls, and you're ideally located to see all that Fontainebleau has to offer. L'Aigle Noir is a stunning spot, boasting lavishly decorated rooms with colourful wallpapers and antiques. A wonderfully romantic bolthole - perfect for a couples retreat. Set in beautiful manicured gardens, Chateau de Bourron is an uber smart six bedroomed hotel featuring original furniture, marble and parquet flooring, plus a gourmet restaurant and a tennis court on site. There's a nearby golf course and all the attractions of the local area. An ideal spot for a romantic break. 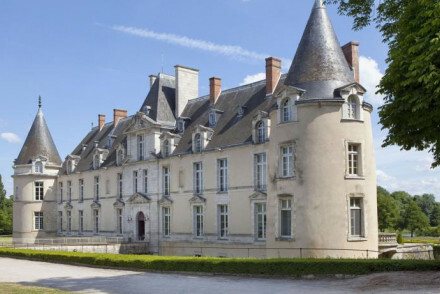 Just 24km from Fontainebleau, Chateau d'Augerville offers the perfect pad for a country escape. Set amid rolling parkland, indulge yourself in the spa, or practise your swing on the golf course. Followed of course by a gourmet dinner in a beautiful panelled dining room. If you think you'd prefer the privacy of a self-catering option then browse through the wide variety available online with our partner, Booking.com. You're probably best off visiting Fontainebleau in the summer, with the average daily temperature rising to 19°C in July and August. That said, this is peak tourist season, so if you fancy a quieter and cheaper alternative then consider coming in September. The weather's still perfectly pleasant to enjoy heading round the town sightseeing. International visitors can fly into Paris CDG Airport or Paris Orly Airport. From here, take the train down to Fontainebleau Avon, a journey which lasts around 35 minutes. 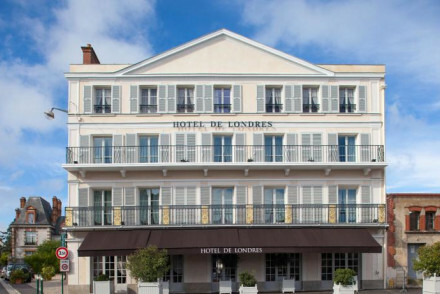 Browse our pick of the best places to stay in Fontainebleau. Expand your search to include Paris or the Ile de France. Alternatively, feel free to contact a friendly guru for advice. A beautiful French chateau set in rolling parkland. It's rooms exude a simple elegance, optimising space and comfort. Its majestic golf course is a distinguished feature and is regarded as one of the most beautiful in France. The perfect place for a relaxing country escape. Country Escape - The ideal country getaway, with expansive landscaped gardens and grounds, bordering the Regional Park of Gâtinais. Total relaxation - Unwind in style with pamperingly plush suites, massage treatments, hammam, sauna and indulgent cuisine. Great walks - Make the most of your stunning surrounds and head off for a walk around the grounds. A charming hotel a short walk from the magnificent Château de Fontainebleau. The rooms exude an understated elegance with tasteful furnishings and selective artwork. With the forest one way and the palace the other, it's perfect for a weekend of exploring Fontainebleau. Local exploring - Perfectly placed for exploring the historic city of Fontainbleu as well as the surrounding forest. Sights nearby - Five minutes walk from the stunning UNESCO World Heritage Site Château de Fontainebleau. Great walks - The forest surrounding Fontainebleau is perfect for walking. 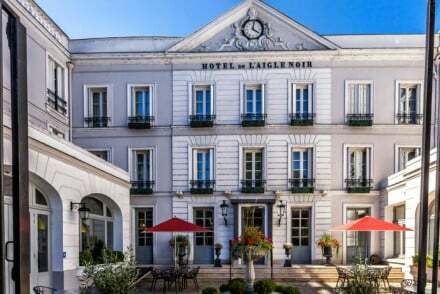 L'Aigle Noir is a marvellous hotel, brimming with Napoleonic imperialism fit for the street it stands on. The rooms are lavishly decorated with magnificent wall papers and period furniture. 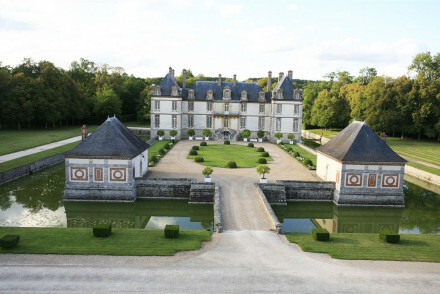 Explore the nearby Fontainebleau Palace or stroll through the beautiful surrounding forest. A majestic gem. Romantic Break - The imperial suites make for an indulgent and romantic weekend break in Fountainebleau. Country Escape - Surrounded by a large, scenic forest, it's perfect for a weekend break from Paris. Sights nearby - A hundred yards from the UNESCO World Heritage Site Fontainebleau Palace. Great walks - There is lovely walking through the Fontainebleau Forest. Located in the centre of Fontainebleau, La Demeure Du Parc offers a range of chic contemporary accommodation designed by renowned architect Mohamed Adib. The restaurant serves gastronomic local dishes and the bar is a trendy spot for a cocktail! A low-key yet stylish stay for foodies! Regal chateau in manicured gardens. Elegant rooms have tapestries, original Versailles parquet and period furniture; bathrooms in pale marble. Tennis court, children's play area and extensive gardens. Gourmet French menu served in the chateau cellar restaurant. Historic, special and romantic.